Archaeologists excavating a burial pit in the ancient capital of Xi’an are hopeful that a trove of ancient artifacts will be unearthed at a site that once guarded the mausoleum of China’s first emperor. The dig, which started late last week, is centered around Pit No. 2 — a 2,150 square-foot (200 square-meter) portion of the buried mausoleum. The site is located in northwest China’s Shaanxi province near the tomb of Emperor Qinshihuang, the founder of the Qin Dynasty (221-206 BC). 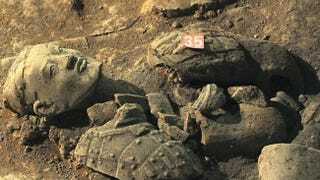 Back in 1974, archaeologists discovered more than 7,000 life-sized terracotta warriors and horses at the site. As Archaeology News Network reports, archaeologist Yuan Zhongyi expects to find 1,400 more Terracotta Warriors and archers, in addition to about 90 horse-drawn chariots. Relics found at the No. 2 Pit. Prior to this dig, Pit No. 2 — a site described as the “essence of the terracotta warriors” — produced remarkable finds, including artifacts with colorful paint that’s still “relatively well preserved,” said Zhonyi. The initial stage of the excavation began in 1994, resulting in the discovery of eight well-preserved figurines.